This is by no means a definitive guide to using compression on the GBA but it is a good introductory guide on how to get some routines working for your own projects, in other words this is not a turtorial about compression, but a tutorial on how to get compression working in your own projects. I wrote this during investigations into these areas because there didn't seem to be much out there on this topic. This is my contribution to a community that has given me plenty of help in return over the years. I am by no means a professional and most of the information and large portions of the code provided here have been taken from other sources such as forum.gbadev.org. I have tried to reference most of these sources. I haven't gone into exhaustive technical detail and tried to keep it readable for the beginner. I hope you find this a valuable resource. Many thanks to the people who have contributed and helped with the information provided in this tutorial. What I don't cover in this tutorial can probably be found at Dovoto's PERN Project, in Jeff Frohwein's Dev'rs GBA Dev FAQs or in tepple's GBADev FAQ. If you still can't find answers to your questions, why not do a search or post on forum.gbadev.org or download mIRC and join #gbadev on EFNet. Also a nice document about the GBA's audio hardware can be found at BeLogic. It's important you get to know the different memory areas of the GBA and how they are used before you get into programming it. A good place to get the technical 'nitty gritty' of the machine is the reference guide Cowbite Virtual Hardware Specs and The Gameboy Advance Technical Info documents. The GBA Header is a 192 Byte ROM Header that is required at the beginning of every ROM to run on hardware. JSensebe mentions that an extra 32 bytes of code is added for multiboot ROMs immediately after this header. You can get gbafix by Dark Fader which will add the ROM Header to your binary. This tutorial uses the free GBA development kit called Dev Kit Advance by Jason Wilkins. The current version is Release 5 (Beta 3) which is the version used in this tutorial. Download the following files from Sourceforge. The homepage of Dev Kit Advance is http://devkitadv.sourceforge.net/ if you want to check for a newer version. Extract the zip files to c:\ which should extract to the folder called devkitadv-r5-beta-3. Launch the DevKit-Advance-R5-Beta-3 icon it it's directory. I recommend downloading the DevKit Advance Here registry hack to enable you to right-click a file or folder anywhere in Explorer to open a DevKit Advance Console ready for compiling. You are now ready to compile! Why use a file system? There are many advantages to using a file system when developing for the GBA. It saves the pain of having to use tools such as bin2h or bin2obj to convert graphics/sound/text etc. into workable data in your programs. It is also much quicker to re-compile work after making changes to data files. GBFS is a file system developed by Damian Yerrick of PinEight and provides a way to access data files using the following C functions. Each data file (Eg. Graphic, sound, text etc.) is appended to your compiled binary and accessed using the above functions. Below shows the GBFS Header for the file system in a pre-compiled GBFS file. The first part defines the GBFS_FILE and is a 32-byte header with the total length of the archive, offset to the directory and the number of files. The second two parts are 32-byte GBFS_ENTRY's and each one contains the filename of the file, length of the object in bytes and the offset to the file. As you can see below there are two files in this GBFS archive, test.chr and test.txt. You can download GBFS here. You shouldn't have any problems getting the Demo to compile, just run the batch file mk.bat from the DevKit Advance command prompt. You should then be able to run test.mb.gba in an emulator such as Visualboy Advance. Lets have a look at how this demo uses the gbfs to store (1) The actual program code (2) Font character data, and (3) Text. Firstly we'll take a look at the batch file that builds the ROM. The important lines here are bolded. Line 04 runs gbfs which joins the files test.chr and test.txt together and adds the GBFS Header to the start of the data and outputs this as the file test.gbfs. Line 07 runs the gcc compiler (from DevKit Advance bin directory) and compiles test.c to x.elf. Line 09 uses objcopy to convert the x.elf file to a binary file, x.bin. Line 11 pads the x.bin file to a 256 byte boundary, according to the author tepples, "The earliest versions of GBFS used a small stride for the linear search, but the current version uses a 256-byte stride for speed. I chose 256 bytes as a tradeoff between the speed requirements of a ROM program and the space requirements of a multi-boot program." Finally, a very important part to remember is using the DOS copy command to join x.bin and test.gbfs and output those joined files to test.mb.gba. This basically joins the GBFS data files to the end of the program code. When we take a look at the actual program code in (test.c) we see how we access these data files from within our program. The line above defines a constant called dat as a pointer to the first file in the file system by searching for the string "PinE". It's important that your binary is aligned to a 256-byte boundary (using something like padbin) before the GBFS data files are appended or the file system will not be able to find the "PinE" during the search. Also you must concatenate the GBFS immediately after the binary file and link libgbfs.c near the end for the above to work. Searches for the file entry called test.chr and returns a pointer to the test.chr data. This searches for the file entry test.txt then returns a pointer to the test.txt data. txt_left is assigned the size of the object (in bytes). The txt variable is a pointer to the test.txt data and is used to move through the text file when outputting the text. Images are notorious for taking up valuable ROM space so it's important that we use compression to minimize the space used by our images. Different compression routines give better results depending on the image. LZ77 is a good all round compression routine for images while the Difference Filter can give varying results but generally not a huge reduction in file size. 8-Bit Huffman works well with 16 colour images and Run-Length works well with images that have large flat colour areas. Here we compare some of the BIOS compression routines on two pictures. The first picture is notoriously hard to compress because most pixels are a different colour. The second image is reduced to 16 colours and demonstrates how the different compression routines work with open areas of colour and less colour. This is a very basic comparison and doesn't demonstrate the power of the compression routines for every type of data, it is for a basic look into how they work on two different types of images. This image uses 256 colours and most pixels are a different colour. This picture is notoriously hard to compress so you may expect better results on your own pictures. This image uses 16-colours and demonstrates how the various compression routines work in this example. As you can see LZ77 is probably the best overall compression routine for images and is the most common one used. The Differential results in the previous comparisons may look misleading since it is often only useful for image or audio samples before running it through an LZ77 or Huffman routine. Again, thanks to tepples for clarifying that for us. He suggests we "take the mandrill16.bmp and run Differencing followed by 8-bit Huffman, reversing the process on display", so how about we give that a try? Hmm running 8-bit Differential then 8-bit Huffman on the file renders a Hybrid file with a size of 14k which surprisingly is the same size of a standard Huffman 8-bit. My guess is that the bmp format is not suited to the Differential compression routine. I tried some other combination Hybrid's using Differential, but didn't seem to render any decent results. Can anyone shed some light on some file formats with work well with this routine? John Sensebe's GBA Crusher is a handy tool for compressing data to include in your projects. It supports all of the GBA's BIOS compression formats and was used in all the compression comparisons and examples in this tutorial. The LZ77 Bios decompression functions decompress at about 300-500 kilobytes per second. You should use the LZ77 VRAM safe mode option, because according to the author John Sensebe, "The compressed data can't reference the previous byte in the decompressed data, because it may not have been written yet by the BIOS due to the 16-bit bus to VRAM. Unfortunately, runs of the same value usually compress by writing an access to the previous byte, so they go wonky unless the compression routine works around the problem." 1. Download Aleksi Eeben's Bimbo program to convert your image to a format the GBA can read. Open the image you want to use. Select Mode 3 and any Dithering you like. Output the file to file.bin. 2. Open John Sensebe's GBA Crusher for compressing the file. Select Add File(s) and select file.bin. Select the LZ77-VRAM safe compression option. Select CRUNCH IT! and then save the file as file.lz. We create a file called lz77.h that will have our assembly functions to call the GBA's built in LZ77 decompression routines using the following code. This code can be slightly modified to use any of the GBA's BIOS decompression routines. Now we create the C code to call these functions and decompress the image to VRAM. The source and binaries for this project are available here. I have created a demo project using all the BIOS Decompression functions placed in decompress.h. 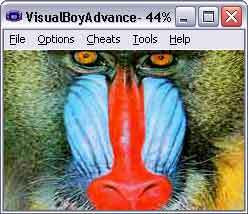 I used Aleksi Eeben's Bimbo to convert mandrill.bmp to a binary mandrill.bin file that the GBA can display. Then using GBA Crusher I compressed them using each compression routine. This demo will go through the following routines (in the order they are presented in GBA Crusher), press the A Button after each display and the screen will blank for a seconds and draw the next decompressed file. Joergen Ibsen's aPLib is one of the best pure LZ-based compression library's available and works exceptionally well for GBA sprite & tile data. It's not the fastest decompression so if speed is a concern then this routine may not be for you. Using aPLib is free for non-commercial use; to use aPLib in a commercial project visit Ibsen Software for registration details. I'm using Markus' gfx2gba to convert my image to GBA 8 colour tile format which conveniently has a built in aPLib compressor. Unfortunately gfx2gba creates a separate file for the palette data so we will need to join the raw binary data with the palette data using copy. The -ap switch in gfx2gba tells it to use the aPLib compressor instead of lz77. My test image gave a 49% compression ratio using aPLib and a 38% ration using LZ77. The de-compressor can't be used to write directly to VRAM because it only writes one byte at a time, although it can be modified to. So the first thing we do is set up a buffer in EWRAM to place our decompressed data before we copy it to VRAM. Then we set our video to Mode 0 and turn on BG 0 to output our tiles. Now we get our pointer to our file with our appended palette and tile data (farm.ap) and place the 32 byte palette data it into our first palette entry. Finally, we decompress our aPLib compressed image data into our buffer in EWRAM and then write it back into VRAM. Then we call draw_map() to write our tile map data and display the image on BG 0. PuCrunch is a hybrid of the LZ77 and Run-Length Encoding compression routines originally written by Pasi Ojala for the C64. PuCrunch is known to run slower than LZ77 but will often give better results than the internal BIOS routines in overall compression. In my tests PuCrunch was slightly outperformed by aPLib in terms of compression. You can visit the official website for PuCrunch here. Jeff Frohwein has kindly re-written the unpacking library for the GBA in ARM/Thumb assembly. PuCrunch can write directly to VRAM by modifying a line in the pucrunch.s source file (view the file for more details). Again using Markus' gfx2gba we convert our image to GBA 8 colour tile format and this time we need to use the pucrunch compressor to pack our image data. We use the -d -c0 switches with pucrunch so our compressed data wont include C64 specific code. I'm using the same code as with the previous aPLib example except we make a call to Jeff's uncompressor function instead. Our second part of the image compression tutorial will be using Burton Radons JPEG Decompression Library to display a JPEG image and Damian Yerrick's GBFS to append the image to the end of our binary code. JPEG is an excellent alternative if you intend on using several 256 colour images in your project. 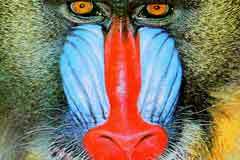 Using Adobe Photoshop and it's Save for the Web facility I managed to get the 256 colour mandrill.bmp down to a 7k JPEG image, so as you can see this is a very good alternative to using the LZ77 compression routine. Currently the JPEG Decompression Library doesn't support all JPEG formats, such as progressive and lossless, but these formats shouldn't be necessary for our projects anyway. Using the GBFS Demo source as our guide, with a gba.h file by eloist containing some important GBA hardware definitions we simply adapt the mk.bat to add our mandrill.jpg file to our binary and add some code to display the image. For this part of the tutorial we will be taking a look at tepples's ADPCM-based 8ad codec, which is a lossy compression technique based on Differencing..
Then we will discover the benefits of running Differencing before a Huffman on an 8-bit sample. This is a lossless method of compression. You can experiment with what works best for your projects and decide on what you want to use. I simply don't have the time to provide comparisons and examples for every combination of compression. Here we have our 16-bit WAV sample to include in our project. Why 16-bits you ask when the GBA hardware is only 8-bit? It's because the clarity of a 16-bit audio file creates a better quality sample after the conversion process. We see a call to tepples wav28ad program that converts the wav file to the 8ad format. Again I won't go into exhaustive detail here since you can take a look at the project code yourself. Our interest here is how much file reduction we get on the chordbasic.wav using ADPCM. The original chordbasic.wav filesize was 140k, and the compressed file chordbasic.8ad is 35k, that's a 1:4 compression ratio, so as you can see this is quite a powerful compression algorithm for GBA sound. I have slightly modified tepples original Demo source and compiled the tools for you. My version removes the keypad handling and screen output. It simply plays the sample in a loop. Changing a line in the code will play the sample once and stop. I thought it would be easier to integrate this into your own project without the overheads. You will undoubtedly enter some problems with tiles and sprite data at some stage noticing that images are displaying in a strange way on the GBA screen. For example, take a look at the following image rendered in Mode 0 using 16 Colour Tiles. (Thanks to Luse for the image provided in the example). You will notice a strange effect happening in the image when it's displaying on the GBA Screen. What is this bright magenta colour? Well, it can be any colour, but the reason it does this is because the GBA always treats Palette Entry 0 as a transparency. The obvious solution to this problem would be to move the effected colour in the Palette to Palette Entry 0, so it will become the background colour black which is what we want. The unfortunate thing is, you won't find many graphic software that provides such a feature including Photoshop (tut tut Adobe). Fortunately there is some software out there, namely Gimp and GraphicsGale as well as the old 16-bit BitEdit/PalEdit that can all do the Palette manipulation required to fix this problem. In this example I will be using GraphicsGale. There is a new program I have written called PalEdit. When we load up barn.bmp we notice that the Background Colour is set to Palette Entry 4. We want to move this to Palette Entry 0, so that our background becomes the transparent colour. Hold down the Shift key and while dragging the Palette Pot to Entry 0. This should solve our problem! This part of the tutorial covers screen effects such as Fades and Alpha Blends (using the register BLDMOD & BLDCOLV/BLDCOLY), Wipes (using Windows & Interrupts), Scrolling (using REG_BGxHOFS & REG_BGxVOFS), Mosaic (using REG_MOSAIC), Sinewave Screen Effects (using HBLANK/VBLANK Interrupts and the REG_BGxHOFS & REG_BGxVOFS scroll registers), Plasma type effects (Colour Cycling combined with Sinewave & Scroll Registers with the tool SinusLab by Hitmen). Currently there are some examples of using Windows (for screen wipes, cross wipes, scanline effects, diamond wipes, and triangle cross wipes) and the Mosaic effect from Alex Pagliaro's (Dark Cloud's) All_Screen_Demos.zip. There are also some interesting effects using palettes and black and white images Swirl.zip. Another interesting effect is Cearn's Spotlight effect, which is discussed in more detail here with source code available from here. There are several MOD Players out there to save you the time of writing your own sound mixing engine, so I will cover some of them here. Here is a comparison of the various MOD Players and the features they provide. 17 � for non-commercial use for full version. 350 � for commercial use. Contact Krawall for more information. For the full version contact Apex for License details. Contact Code Waves for commercial use. I recommend downloading the free MODPlug Tracker to see how this format is used to store music. MODPlug can read/write Protracker (MOD), Scream Tracker (S3M), Fast Tracker (XM) and Impulse Tracker (IT) files. Skale Tracker is another free tracker available for PC and Unix, and has a nicer interface for actually making music IMO. Skale Tracker can load/save in SKM (Skale), WAV, OGG, XM (Fast Tracker II), MOD and MID (MIDI) format. Try them both out and decide for yourself what you want to use. For general conversion work MODPlug Tracker should be fine. If your interested in writing tunes for the GBA professionally, you might want to check out what the pro's use and that's MED Sound Studio by RBF Software. I'm a beta-tester and V2 is currently in the works. Anyone who remembers OctaMED on the Amiga will know this Tracker well. You can check out an interview I had with the oldskool tracker musician Alistair Brimble about MED and music. He currently makes music professionally for the GBA and several other consoles. You can read the interview here. Notes are represented by columns of data that are joined by blocks or patterns. For the GBA, we can get a fairly decent tune working with 4 channels (tracks) of audio using 8-bit mono samples. If you want to check out the MOD used in this tutorial and see how MODPlug plays the tune, you can download zak by doh. Another F**king Module Player by Silpheed and Groepaz of Hitmen is one of the best freeware players out there. With AFM it's just a matter of giving it a pointer to the MOD data and away it goes which means it's fairly easy to get working with a file system like GBFS. // need to be first in internal RAM! SetMode(MODE_0 | BG2_ENABLE); // Enable mode 3 and turn on background 2. REG_BG2CNT = 0; // Clear all BG2 parameters. As you may have noticed I haven't used makefile's but a simple batch file because I think it's easier to understand for the beginner and as you get more advanced you can convert the batch file over to a makefile. All of the players featured on this page use Jeff Frohwein's crt0.s (Startup code) and Linker Script and it's essential to add these to the linking part using the -Tlnkscript and -nostartfiles options in gcc. You can obtain copies of Jeff's crt0.s and other helpful GBA stuff from his excellent website Gameboy Advance Dev'rs. That's it! I don't really need to explain how the GBFS attaches the MOD to the ROM, or how you get the pointer to the file using gbfs_get_obj because we learnt that earlier in the tute about GBFS. The Krawall Soundsystem by Sebastian Kienzl is quite a good S3M/XM Player and it has it's own benefits and downfalls. S3M by the way is the old Scream Tracker module format. MODPlug can convert MOD's over to S3M's, just load up the song and in the main window, select the general tab, under song type click change... and change it to ScreamTracker S3M then save it. The good part about this audio system is that it has the ability to attach empty S3M's that contain sample's (but no music data) for playing sound effects while the module is playing. A disadvantage is that it needs to convert the S3M to a format it can understand first. This is not necessary a problem since you can just add a line in your makefile to convert them over. The problem is you can't just attach the S3M to your binary code using GBFS. Krawall has a FREE SDK based on an older version without XM support. This is the version used in my code example. You can probably expect better results in the license version. Perhaps I will modify it some day to work with GBFS. The Apex Audio System (AAS) by Apex Designs is another free for non-commercial use MOD Player. It works in a similar vein to Krawall in that it converts the MOD file to a format it understands. It also has the ability to play WAV or RAW samples while the MOD is playing. If you use the free version you have to display the Apex logo at the start of your ROM. I have not got this working with GBFS yet. Fras Player by DannyBoy is free for both non-/commercial projects and looks like a pretty good player. Although it doesn't seem to play my example zak.mod very well, the country.mod used in his example does sound ok. My advice would be to download the player and have a listen to how it works with your MOD before you decided to use this. Because of the conversion required of the MOD to a format it can understand, I have not converted it to work with GBFS yet. The MASO System was developed by fl0w. I have to admit I had a few problems with this player. First of all getting my zak.mod converted to an xm format it would accept was not easy. I tried MODPlug Tracker to save the mod to the Fast Tracker xm format, but then the MASO conversion program protested saying it doesn't "support Amiga frequency tables". Not one to be deterred by such things I looked up the xm header format and found that by changing a byte at offset 74 (0x4A) from 00 to 01 the converter would think it used a Linear frequency table instead. Ok, so it compiled ok but a little way into the tune it would crash in Visualboy Advance saying "Unsupported BIOS function FE called". So I tried using Skale Tracker to convert it from a MOD to XM but the same problem occurred. I tried running my binary in VBA with a GBA BIOS file but Visualboy would just reset at the same point instead. I tried compiling with the xm object file supplied with Fl0w's example (for legal reasons he doesn't supply the actual xm file in his MASO distribution example) and the song played fine. Obviously there was something it didn't like about my zak.mod file. At first I thought it was one of the commands such as Arpeggio or Vibrato. But I soon figured out the problem was in fact that the MASO System doesn't like notes that don't specify a key (eg. C#-5). In a normal tracker circumstance you can generally just specify the sample number and it will play the same key & octave as the previous note, just with this new sample instead. I could use MODPlug's search and replace to fix this, but I didn't bother. Perhaps it will work better with your xm? Please note that all the code on my page is modified by me to work with DevKit Advance. To get the original code please visit the associated website. Code Waves' Music Wave Engine is the only MOD Player supporting sample playback that I have got to work with GBFS. This is mainly because it uses the raw MOD data and you can just give it a pointer to it in ROM. For some reason he has created custom start up code instead of implementing Jeff's crt0.s. This means this player could be a little awkward to merge with your existing code. NEiM0D's NMod Player is a fairly decent MOD Player which I managed to get working with the GBFS quite easily. Again I won't bore you with the code necessary to get this working since you can download the project and see for yourself. A special thanks to Damian Yerrick (Tepples) for GBFS, the gbadev FAQ, and much of the code used in this tutorial. Also he has helped refine the information provided here and clarify some things. Let me know if I've missed your name. Go out to Team Magnolia, GBATemp, gbadev.org, forum.gbadev.org, #gbadev, gbaemu, Pocket Heaven... and everyone else I've met and spoken to over the years in the GBA community. Korth, M. (2001-2002). Gameboy Advance Technical Info [On-line]. Available WWW: http://www.work.de/nocash/gbatek.htm. [2004, 1 February].